Tickets for the one-day bus pilgrimage from the Archdiocese of Baltimore to the papal Mass in Philadelphia will go on sale online June 29, at 10 a.m. Pick-up locations for the journey include points around the archdiocese, and, for an additional charge, an option to take an Amtrak train. The cost of the daylong pilgrimage is $99 for the bus. The train cost is $159 for adults, $154 for seniors (62 and older), and $119 for children (ages 2-12). Anyone under the age of 18, on the bus or train, must be accompanied by a parent or guardian. 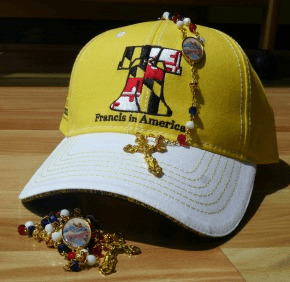 All pilgrims traveling with the archdiocesan group, coordinated by Catholic Review Media, will receive a special rosary created for the event; a commemorative hat, bottled water and other services. The Mass, which will be held along Benjamin Franklin Parkway in Philadelphia’s Center City, is likely the only event open to the general public during Pope Francis’ six days in the United States, Sept. 22-27. Other Masses and most of the events on the pope’s itinerary will be tightly ticketed or for limited audiences, such as the U.S. Congress and the United Nations. There is so much interest in the pilgrimage that, even with 39 buses and a whole train car on Amtrak, Gunty expects the pilgrimage tickets will sell out very quickly. The Baltimore planners have been in touch regarding logistics with organizers of the World Meeting of Families, which culminates with the Sunday Mass. All buses carrying pilgrims into and out of Philadelphia the weekend of Sept. 26-27 will have to register in advance, according to CatholicPhilly.com. On the day of the events, all registered vehicles will be assigned entry and exit times to Philadelphia and assigned parking areas. The day will include a lot of walking, waiting and standing – and praying. “The pilgrimage will give Catholics an opportunity to join hundreds of thousands of people with the same focus: on Jesus and his church,” Gunty said. • FNP parking lot, 351 Ballenger Center Dr., Frederick (courtesy Frederick News Post). The Amtrak train will depart Baltimore Penn Station, 1500 N. Charles St., Sept. 27, 6:08 a.m. (check in 4:30-5:10 a.m.). The return trip will leave Philadelphia 30th Street Station at 9:30 p.m., scheduled to arrive in Baltimore at 10:38 p.m. Penn Station has on-site parking for a fee. Information and a link to the ticketing portal is available by visiting francisinphilly.org. Online ticketing will open Monday, June 29, 10 a.m. EDT.